We LOVED Cirque du Soleil - Amaluna! 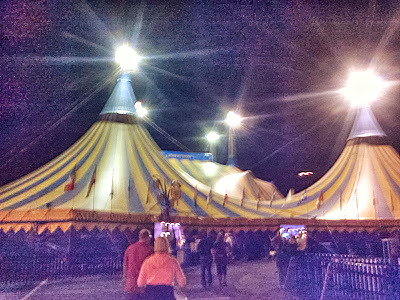 The Cirque du Soleil Amaluna show was under this Big Tent! As I promised, I want to tell you all about the Cirque du Soleil - Amaluna show I saw the other night at the Mall of America in Bloomington, MN! 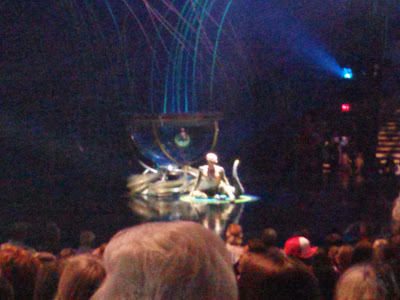 It was just as amazing as I hoped it would be and I am so happy to finally say I saw a Cirque du Soleil show!!!! The show was loud, colorful, fun and the music was so awesome! My favorite part was that Amaluna is the first Cirque du Soleil to have 70% female cast and the rock band was 100% female! They were awesome and all the music was played live by the band! This show had many firsts, including the first time they have used the uneven bars in a show! How unique and amazing to be able to include that and move it off and on the stage! We even got to meet two members of the cast after the show and ask a zillion questions! It was so fun to get a behind the scenes look at the show and characters! Many of the cast members come from a college gymnastics and circus backgrounds! 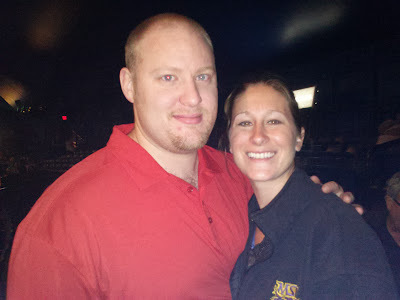 We met Raphael Hérault (who flew around on the Teeterboards) and Sumer Hubbard (Amazon girl/Uneven Bars). My husband and I had such a blast taking my mom and dad to the show and each one of us had a different favorite part of the show! I have to say that the people in this show are incredibly STRONG and some of the acts they did were UNBELIEVABLE!!! WOW!!!! The main character, Miranda, did one-handed handstands on the side of the pool while moving her body in all directions! That was A-Mazing! And the other main character, Romeo, climbed up a tall pole with just his arms! Their strength and endurance was unbelievable! So if the Cirque du Soleil is ALWAYS something you have been wanting to see, DON'T delay! 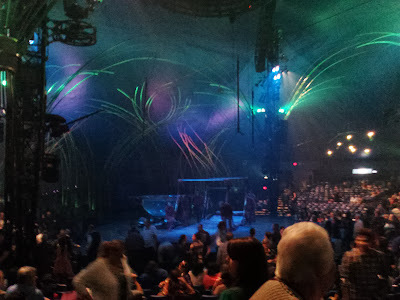 Although Amaluna is a smaller production than the Cirque Las Vegas shows, it is still AMAZING and you don't have to travel to Las Vegas to see it! Make sure to check their schedule to see when they come near you this year! And don't forget if you live in Minnesota or nearby, to enter our giveaway for FOUR Cirque du Soleil Amaluna tickets. You have ONE more week to enter so hurry over to enter!! !